Add olive oil to a pan on medium heat, brown ground beef with chopped onion and minced garlic. Then add tomatoes, bell pepper, chile powder, oregano, cumin, and salt. 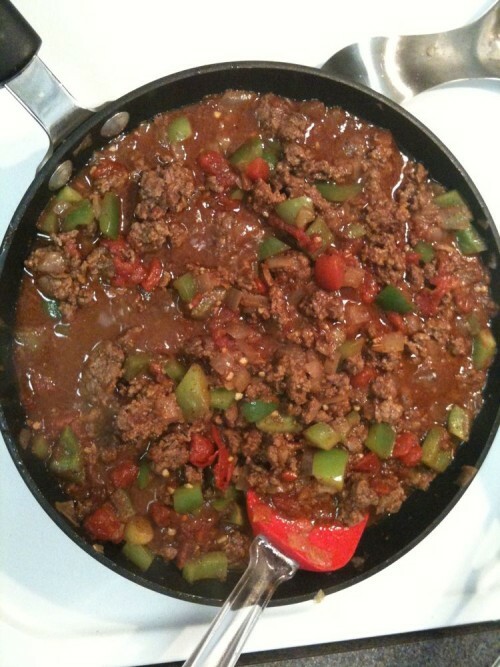 Then simmer the mixture for 20 mins or until the meat and green peppers are tender and the tomatoes cook into a sauce. Salt and pepper to taste. Possibly the addition of some tomato paste might be good, though I didn’t have any while making this dish this week and it tasted great. This is my favourite chili recipe. I’ve been making it for years now and nothing beats it. YUM!